Amtrak derailment, 5/12/15 (Photo from NY Daily News). The Amtrak train derailment in Philadelphia was a terrible shock. My thoughts and prayers are with the families of all the victims, including at least eight victims confirmed dead and dozens more who were injured. Among the dead, at least two were Jewish. Rachel Jacobs, a 39-year-old wife and mother was CEO of an education startup organization and an active member of the Jewish community. Justin Zemser was a 20-year-old midshipman at the US Naval Academy. I grieve their loss and that of the six other victims. I’m sure many in my circle are within two to three degrees of separation of passengers on that train. Two former USY counselors of mine reported on Facebook that their son was on the train and was bruised, but not seriously hurt. 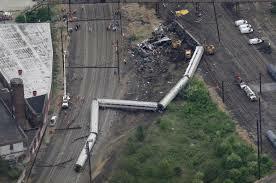 The derailment and the destruction it caused underscore the randomness of life events. We go about the routines of our daily lives doing things that we often don’t think twice about, and yet we are vulnerable at any time. The tragedy also underscores the human capacity for error and the dire consequences that can result. Hopefully, the investigation will reveal why the train was speeding at over 100 miles per hour in a 50-mph zone. As we observe the unfolding of this senseless tragedy, it’s important that we focus not only on the loss and destruction, but also those who burst into action to help those in danger. This sensibility is rooted in this week’s Torah reading as we close out the book of Leviticus in Behar-Behukotai. At the heart of Parashat Behar is the notion that everything in the world belongs to God—ki li haaretz, ki gerim v’toshavim atem imadi—for the Land in Mine, for you are but strangers and sojourners with me. The upshot of this is that all of God’s creation, all matter living and not living, belongs to God not us. We therefore must in the words of the prophet Micah, walk humbly before God. The second half of today’s reading, Behukotai, closes the book of Vayikra with a series of blessings and curses; blessings for being true to God’s laws, and curses for straying from them. I’m not going to address the challenge of reward and punishment theology that this parasha raises. Taking a bird’s eye view of this parasha, it’s not about the particulars of our lives—it’s about life in general. It’s about the good things in life- the joy, the pleasures, the blessings—such as the joy when we celebrate a wedding or the birth of a child. But the parasha also describes the hardship, the suffering and the pain. The Torah is saying welcome to the real world. Life is often good. Yet, life is often filled with great difficulty. The Torah’s mission is to teach us that we are tenants of God’s world and at the same time, we are very much of the world. We are stakeholders in the world, and it’s in our own self-interest to live a just and righteous life. In the blessings portion, we read: vishavtem lavetach b’artz’chem…v’natati shalom baAretz—You will dwell in your Land safely, and I will give peace in the Land. According to Hasidic teachings, a question is asked: after the Torah has stipulated that “you will dwell in your land safely,” why does it have to state, “I will give peace in the land”? The reference here, then, is to internal peace, within yourselves, between one another, between one party and another, between one faction and another. I don’t interpret this teaching that bad stuff in the world will never happen. I read it to say that human beings will help one another achieve inner peace amidst great challenges. As the world’s attention is focused on the Philadelphia train derailment, I believe this Hasidic teaching and the wisdom of Fred Rogers call on us to remember the helpers. The Philadelphia Inquirer and other news outlets reported numerous examples of heroism by first responders, passengers and bystanders. There were the firefighters who arrived on the scene to pull trapped passengers from mangled cars; police officers who rushed into the train or drove patients to hospitals by the dozens in wagons; passengers who, as their rescuers broke into the cars, asked them to first help the more injured around them. Imagine the presence of mind of these passengers. They’re banged up, they’re bloodied, they may have broken bones. On top of all that, they’re sitting in a train car turned upside down. They are probably frightened beyond belief and want nothing more than to get out. Rescue workers arrive on the scene and, in the midst of this chaos, they directed the first responders towards passengers who needed even more help. In the midst of human tragedy, it is awe-inspiring the extent to which people can open their hearts to help others in need, even in the midst of one’s own suffering. If human beings have the capacity for such compassion when under such pressure, then all the more so in our day-to-day lives—when we don’t feel immediate danger–we have the capacity for compassion and loving kindness. Today, as we close the Book of Leviticus, let us take to heart its great wisdom for life. As we see today, two of the messages with which the book closes are that we must be humble before God and that we must pursue peace. May God grant us the strength to continue this noble mission.